Apple has an obsession with connectors. It loves Lightning cables, hates 3.5mm auxiliary audio jacks and has removed everything that’s not a USB-C connection from its latest 12-inch MacBook. It’s so obsessed, apparently, that it has its eye on an 8-pin connector called the Ultra Accessory Connector, or UAC for short. Apple recently included the specification for the new connector type for iPhones, iPads and other iOS devices in its Made-for-iPhone (MFi) licensing program in hopes to get the world ready for a possible switch. The connector, which some electronics like Nikon cameras have been using for years, is smaller than USB-C at 2.05mm by 4.85mm, and its purpose is to reduce the space needed for connectors on the next generation of third-party devices. Sources close to the matter told 9to5Mac that the connector could replace Lightning and USB-C connections altogether – though the jury's out if that's what will actually happen. 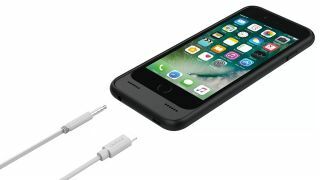 In practice, what's more likely to happen is you might buy a pair of headphones that have a UAC port that then connects to the Lightning port on your phone, or vice-versa. In that sense UAC might help to resolve the USB-C, Lightning Port, 3.5mm jack dilemma by introducing a dongle to iOS devices that can do all three. To that end, the sources tell 9to5Mac that Apple will allow third-party manufacturers to make Lightning to UAC, USB-A to UAC, and 3.5mm headset jacks to UAC cables – letting headphones with the new connection type work with a variety of Apple devices. Now, there’s no doubt that there’s some real, practical purpose here – a new connector that saves space and connects to any number of next-gen devices sounds like a good thing – but for the most part this is probably going to alarm and upset a large group of consumers, most of whom haven’t gotten over Apple’s decision to remove the 3.5mm audio jack from the iPhone 7. For now at least, it seems like Apple’s focus for UAC devices is headphones designed as part of the official Made-for-iPhone (MFi) licensing program and hasn’t mentioned using the standard across the board for all peripherals moving forward. Then again, the Lightning connector was just a spec at one time, too, and now it’s the only connection on iPhone. Because most of the information we have so far about UAC comes from anonymous sources and not from Apple directly, the best thing to do now is watch and wait. But should Apple allow third-party manufacturers to press on full steam with the adoption of yet another cable standard, the best course of action would be to buy wireless headphones from here on out – Bluetooth, thankfully, is fairly ubiquitous right now. The other option is to go in the other direction and buy into the Lightning-connected ecosystem Apple has created that includes headsets like the upcoming Beats X earbuds. The third viable option, of course, is buying Android devices instead.